14 year old Rhys Irwin from County Donegal picked up a number of prestigious awards last weekend at the 2016 British Thundersport GB Awards ceremony. 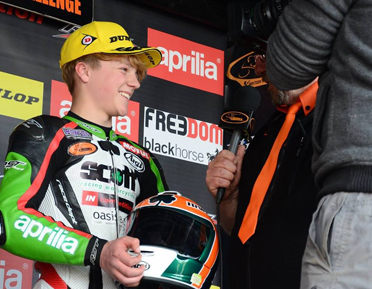 The rising Motorcycle racing star was present to collect his runner-up trophy for the 2016 Superteens championship and was delighted to also pick up two more important accolades. Rhys received his championship trophy from series founder Ian Newton following a very successful season which saw him emerge as the most successful ever Irish Superteen competitor with six wins and twenty five podiums. Having picked up his first award the teenage was then called back to collect the ‘Overall Outstanding Performance for the Thundersport Series in 2016’. This award is presented to the competitor who has put in the most outstanding performances across all of the Thundersport classes and is a testament to the incredible ability which Rhys has shown in just his second season of racing. Finally, to top of what has been an amazing season for the Irish rider, Rhys received a third award, the ‘John Ward Memorial Trophy’, which is awarded annually by the Thundersport commentators to the rider who most impressed them and who they most enjoyed commentating on. Rhys also acknowledged all of his sponsors without whom he could not go racing, main sponsor James Gallagher of Oasis Bar Letterkenny, Grace Ann and Wesley Regan of Clean Rubber Sligo & Donegal, Denis Sheridan of DS Waste Kilmacrennan, Kelly’s Centra Mountain Top and Uncle Eustace of Joe Macs in Portadown. With the 2016 season now wrapped up Rhys’s attention turns towards preparing for he 2017 season and the debut of Team Irwin Racing who will run both himself and his brother Caolán in Thundersport and selected Irish events.